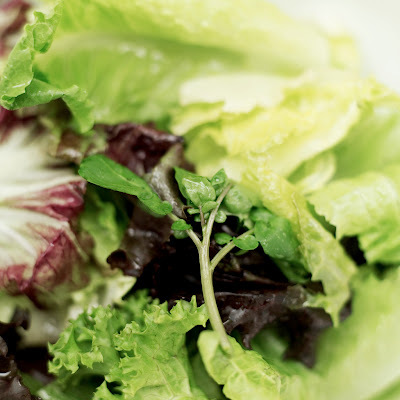 The basic ingredients of a vinaigrette are oil, vinegar, and mustard. The mustard serves as an emulsifier- it bonds to both the vinegar and oil to help them stay mixed together. I use a rough ratio of 1 part vinegar (of your choice- my faves are red wine and balsamic) to 2 parts oil (I love olive oil, but canola is fine) with a couple spoonfuls of mustard, but you should experiment and find the ratio you like. Try to use the best quality ingredients you can find- with recipes this simple, nice olive oil and tasty dijon mustard will make all the difference. Add some salt and pepper to your liking, and whip it up with a whisk or a fork. It'll taste fantastic all on it's own, or you can experiment with any of the following add-ins: chopped garlic, red onion or shallots, fresh herbs (parsley, basil, chervil, chives, thyme, sage, tarragon, rosemary- whatever you want to try), lemon, honey... heck, throw in the kitchen sink. Make a batch in an old jar with a lid (or pour out that supermarket dressing and use that bottle), and keep it in the fridge- it will last for weeks (the vinegar acts as a preservative) and actually tastes better as it ages and the flavors all mingle. Salad snobs rejoice! Mix all the ingredients (except the olive oil) together with a fork. Stir the olive oil in last. Yum! As a Charmed-Friend and sometimes sous-chef to this fabulous lady (ok, more like side prep kitchen assistant - but can't a girl dream? ), I can testify that this salad dressing is FAN-friggin'-amazing! TRY IT!